Gambling tax regulations vary vastly from place to place. In some countries, it’s 100% illegal. In countries where it is legal, there are rules and regulations. Sometimes casinos, gaming and betting establishments are legally obliged to pay tax on their profits. In some cases, the individual must pay tax on their winnings. Other times these taxes are very high, sometimes they’re very low – making these places a haven for gamblers and casino operators. But what do gambling taxes look like around the world? While the rules are different from country to country, in many cases you’ll only be taxed if gambling is your profession or your main source of income. This means if you gamble and you win, but you have a more substantial source of income and you don’t rely on gambling to earn a living, you won’t be taxed. 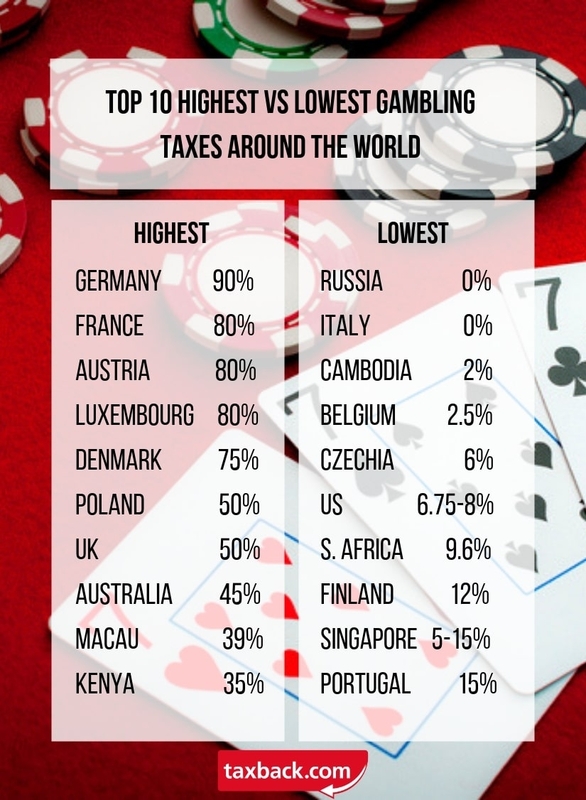 Here’s a chart showing the Top 10 countries with the highest and the lowest gambling tax rates. In many countries like Ireland and Kenya for instance, the player isn’t taxed on their winnings. Instead, the bookies must pay a certain percentage of tax on the total bets or winnings they record. Irish bookies pay 1% tax on all bets placed through their service. In Kenya, bookies pay 7.5% tax on all winnings they record. In 2017, Kenya upped their tax percentage rate to 35% with hopes of helping young people pursue career choices other than gambling. Meanwhile, Cambodia has lowered its tax rate drastically in a bid to encourage new businesses to invest in its gambling industry. 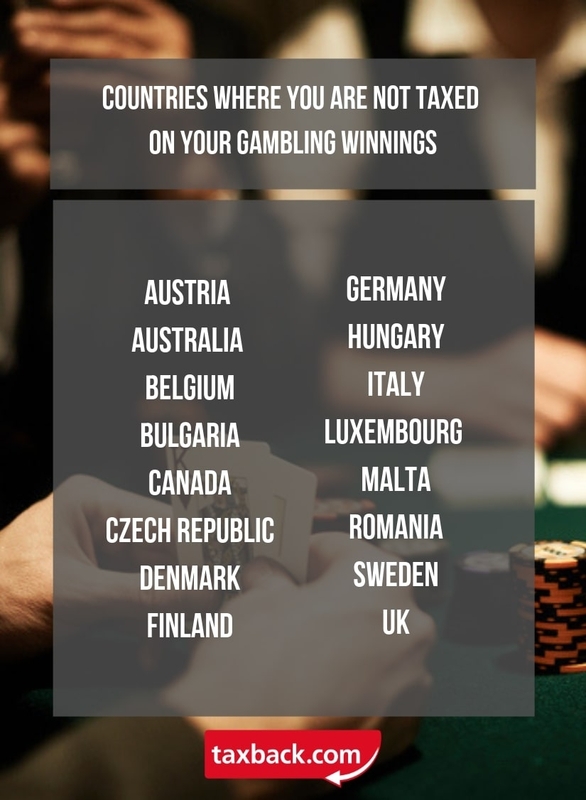 Here’s a list of countries where gambling is legal but only the casinos and bookies pay meaning you won’t have to fork over a penny of your winnings to the tax man! There is somewhat of a monopoly on the gambling industry in Austria; a company called Casinos Austria owns 12/13 of Austria’s casinos and many more throughout the world. They’ve been operating since 1934. Players are not taxed on their winnings. The casino is responsible for paying tax regardless of whether they operate or via a physical establishment aka a land-based casino or an online casino. 35-80% of all steaks placed at any casino in Austria, must be paid by the casino operator. People were gambling on horse racing in Australia from the early 1800s. Over a century later, they saw the introduction of legal poker machines. Gambling tax in Australia doesn’t apply to winnings if they were made via an online casino or a land-based casino. Again, casino operators are obliged to pay license fees in addition to taxes on gambling although the exact numbers vary from state to state. For instance, some states base their gambling taxes on turnover while some base it on net profit or player loss. People have been gambling in Belgium since the 1300s, online gambling was legalised in 2002. Licensing procedures are the same for online and land-based casinos. There is a limited number of licenses available for gambling companies. Belgium does not enforce taxation on gambling winnings for either online or land-based casinos. Players aren’t taxed but companies must contribute a fee to the government each year in exchange for a license. Gambling began in Bulgaria in 1933 but the Bulgarian government didn’t introduce licencing or any kind of taxation system until 1998. In 2008, they legalised online gambling – clear regulations were only put into place in 2012, official gambling sites made an appearance in 2013 and with that a new tax turnover introduced for online casino operators. Bulgaria doesn’t charge tax online winnings. Casino operators pay €17,500 for each license and location in which they operate their casino. Roulette and table games are taxed at a fixed amount. Gambling has been in Canada since the 1400s. All types of gambling were banned in 1892. Eventually, bingo and raffles and horse racing were legalised in the early 1900s. Now there are casinos in almost every Canadian province. You won’t be taxed if you gamble in online or land-based casinos. In the 90s, there was a massive boom in the Czech casino scene. There are currently around 180 land-based casinos across the country and several more online casinos. Online gambling is also legal. Casino operators pay 6-20% tax on their profits. Denmark isn’t known for having a whole lot of casinos. In fact, there are only 6 and they are all regulated by the Danish Gambling Authority. You won’t be charged any tax on your winnings but casinos have to pay from 45%-75% of their gross gaming revenue. Despite Finland’s long gambling history, it has only one legal casino which was built in Helsinki in 1991. Casino operators in Finland must pay 8.25% on their net profits. Oh and all profits are donated to charity! Germany has the highest gambling tax in the world. Casinos are taxed 90% of their gross gaming revenue! Taxes for private casinos have their own unique taxation rules. Italy’s gambling history goes all the way back to the Roman Empire when emperors would play the game, Dice. The first legal casino opened in Venice in 1638. Gambling was subject to regulation in 2006 after the appearance of online casinos. Casino operators pay just 1% on their total gaming revenue. The first Lotto Act in Malta dates all the way back to 1922. Gambling is now regulated by the Lotteries and Gaming Authority who issue licenses to land-based and online casinos. Casinos pay a €46,000 licensing fee and an additional 15-40% of their gross turnover. After the Soviet Union took control of Romania in 1945, all forms of gambling were banned. In 1989 the ban was lifted as a result of the new ruling democratic government. In 1990, it was declared legal once again. Online gambling was made legal in 2010 so long as operators have a government license. There is just one casino operator in all of Sweden that has been granted a license – the operator is Svenska Spel and it is a state-baked casino operation. In 2002 they gained the rights to broaden the online market with the introduction of the Lotteries Act. Gambling was legalised in the UK in 1968 with the introduction of the Gambling Act. In 2005, the act was amended to include regional and online casinos. Casino operators pay 2.5-40% of their gross gaming revenue. So you might be wondering, do I have to pay tax on my online gambling winnings? This will depend on your location. 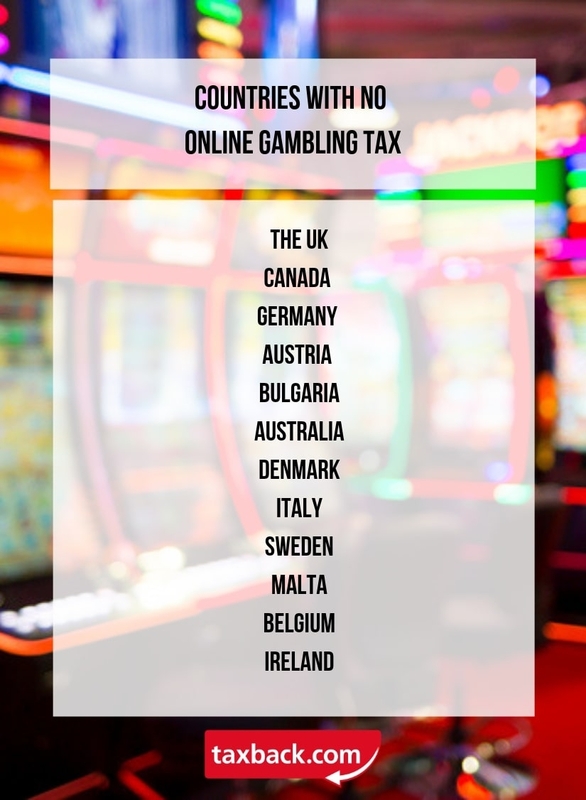 If you’re based in the UK, Europe, Oceania and Canada, then no, you likely will not have to pay any tax on your online gambling winnings. In the US, you must declare your gambling winnings on your tax return each year. Taxback.com have got your back! So, there you have it, a comprehensive guide to gambling taxes around the world! If you need help filing your gambling income taxes – contact Taxback.com today and we’ll help you through every step of the way. Taxback.com helps our customers file taxes in 13 countries worldwide. Contact us today if you’d like to claim a tax refund from Ireland, the UK, Germany, New Zealand, Australia, Austria, Holland, Canada, the US, Japan, Luxembourg or Denmark. Our team of friendly tax experts will make sure that you get the maximum legal refund you’re entitled to… and not a penny less!